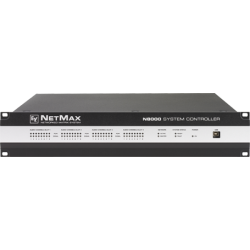 The NetMax N8000 System Controller is a state-of-the-art digital matrix system offering comprehensive management of all aspects of professional sound reinforcement systems. Supporting both distributed and central processing, NetMax is a powerful physical complement to EV's IRIS-Net protocol, which gives designers and end-users the industry’s most flexible routing, DSP, and component-level system control and supervision. EQ, crossovers, dynamics, FIR-Drive loudspeaker optimization—NetMax does it all with superior digital fidelity. Each 2RU NetMax chassis supports up to 1900 MIPS of processing power and up to 32 local audio channels. And with NetMax's modular, field-configurable architecture, every system can be tailored to current needs without being locked out of future expansion. Designed for both installations and touring systems, NetMax is an indispensable tool for concert halls, houses of worship, hotels, casinos, convention centers, sporting arenas, and stadiums. Simply put, there's no more powerful, intelligent way to tame the complexity of modern sound systems than NetMax. DC-One2‑In/6‑Out Sound System ProcessorDC-One Editor software control via USB portAnalog or AES/EBU ..
DC-One Editor SoftwarePC‑Based Editing Software for DC‑OneEasy connection to DC-One hardware via USB..
DI-1NetMax 8‑CH Digital Input CardEight channels of AES/EBU or S/PDIF digital audioFour input connec..
DO-1NetMax 8‑CH Digital Output CardEight channels of AES/EBU digital audio outputFour Euroblock outp..
DSP-2N8000 1500 MIPS DSP Expansion ModuleEnhanced DSP power for NetMax controllersAdds 1500 MIPS com..
MI‑1NetMax 8‑CH Analog Mic/Line Input CardEight electronically balanced mic/line inputsEuroblock con..
N8000NetMax 300 MIPS Digital Matrix ControllerFull IRIS-Net supervision, control, and schedulingComp..
OM-1OMNEO/Dante ModuleGigabit Ethernet Interface - 1000 Mbit/s full-duplex Ethernet Interface, IEEE ..
UCC1Remote Control Interface for IRIS‑NetUSB-CAN converter for IRIS-Net enabled devicesSupports up t..